From Baxter to Belfast - From Great Pond to Grand Lake Stream - From Monhegan to Moosehead . I'm all about rediscovering the Maine outdoors and my family's connection with it. It was a lovely Columbus Day. 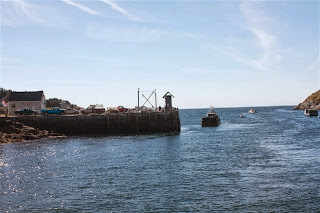 Converging on The Monhegan Boat Line wharf in Port Clyde, my traveling companions and I were excited to board The Elizabeth Ann for the approximately 1 hour, 12 mile trip. This was the inviting scene that presented itself to us...a beautiful, calm morning in Port Clyde with not a person to be seen on the wharf. Of course that would soon change with an assortment of passengers ranging from dogs, to day hikers, to residents, to banged up lobster fisherman returning to the island after some mainland treatment. After a last cup of coffee from the general store we impatiently waited for our ride to pick us up for the lovely ride out to the island. 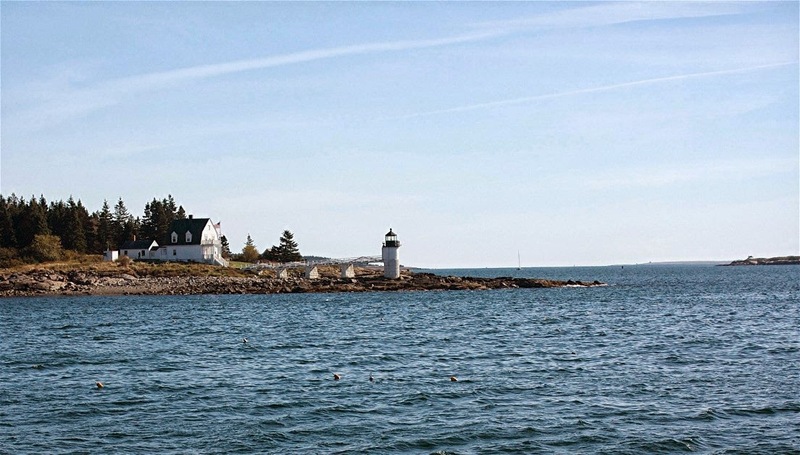 But in the time that we had we were able to sit and enjoy our surroundings on a lovely Maine coast morning. 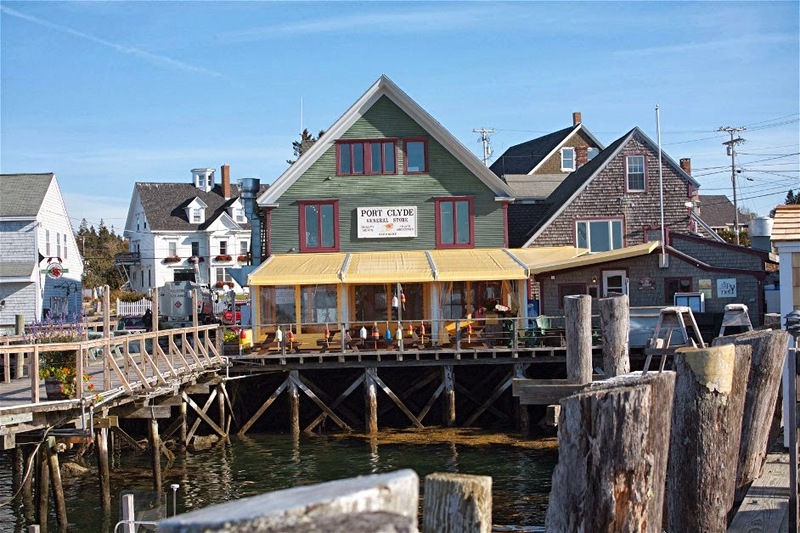 Port Clyde is much different in the warm weather than in winter but still hasn't lost it's old time Maine feeling. We would experience much more of that when we at last got to our destination. 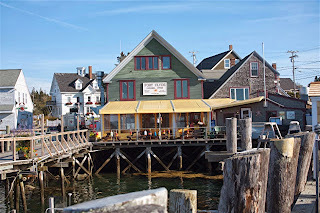 Years ago on my only other trip to Monhegan our ride was The Laura B which has always looked to me to be a converted sardine carrier. But The Elizabeth Ann was our ride this morning. 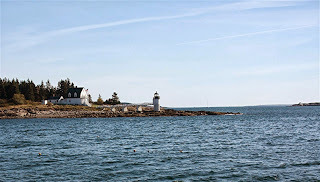 Leaving the inner harbor behind us we churned past Marshall Point Lighthouse. This 24 foot, "new" tower was built in 1858 and had a keeper until 1971 when it was automated. 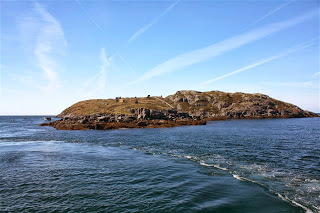 After about an hour's ride over slightly choppy seas and through a maze of lobster buoys, we were closing in on Manana ( or "Hermit" ) Island where goats still graze its weathered surface. And off to our port side lay our destination. dusty lanes lanes and trails of Monhegan Island. We were ready! Truely amazing pictures for a guy that was raise in the west. Look forward to more. Thanks Howard..I'll be putting something together soon.. I would truly enjoy a cup of in that general store some day. I would truly enjoy buying you one there Brk Trt! Boy is it ever Erin .. thanks for the comment! Doesn't It Just Tick You Off? Just re-connecting to my family tradition of fishing and Maine outdoors.